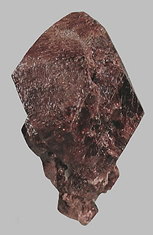 A partial crystal of the uncommon manganese mineral, Pyroxmangite, that is covered on one face by a mat of the magnesium-iron-manganese amphibole mineral, Cummingtonite. 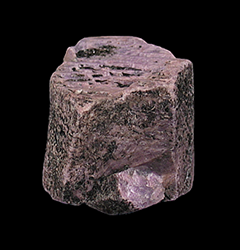 Pyroxmangite is often confused with Rhodonite. 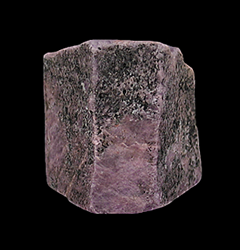 Pyroxmangite is the high-pressure, low-temperature polymorph of Rhodonite, both of which are manganese silicates. 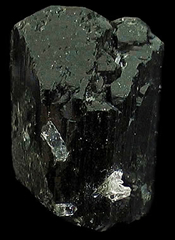 This prism of Rutile is a rather large example of this species as far as Pakistan is concerned. 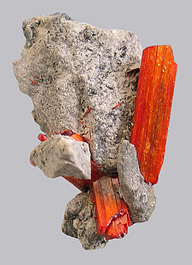 Where Rutile is usually only found in crystals 1.5-2 cm in size, This crystal shows some red in good lighting conditions and is undamaged. A rare and very old specimen. These nodules of crystallized Pyrite were found in the clay pits of Sayreville, New Jersey. It is composed of crude cubic crystals with octahedral-modified corners. This is a very large specimen for the locality. 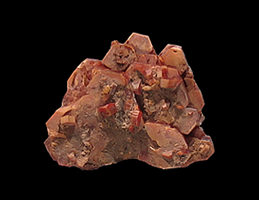 A rather large and hoppered crystal of Morocco's signature mineral, Vanadinite. This richly-colored specimen is complete all around and makes for an eye-catching display piece. These dramatic Chalcedony pseudomorphs after Anhydrite were collected over a period of 10 years by my friend, Al Rose. This material has the distinction of being mentioned not once but twice in The Mineralogical Record's what's new in minerals. Not many of these were found and are much sought after by collectors of Arizona minerals as well as by pseudomorph collectors. Here we have a chunky polychromatic Sapphire. This specimen features a stepped termination and has a dusting of Biotite crystals. The crystal shown here shows varying shades of red-purple depending on which lighting source you use to look at it. This Sapphire is rather large for the location. Here we have a 2.5 centimeter crystal of ruby on a matrix of Calcite. the crystal has a good luster and does allow some light to pass through. Depending on the lighting that it is viewed under the specimen will either appear red or a purple-red colored. Ganesh is one of the oldest and more renowned Ruby & Sapphire localities in the world. A beautiful, water-clear Hyalite Opal perched on matrix. This Opal is so glossy and transparent, it is very difficult to photograph. The formation of the Opal resembles bubbling water. This specimen is also covered with numerous white crystals of the rare, carbonate-rich variety of the mineral Fluorapatite. 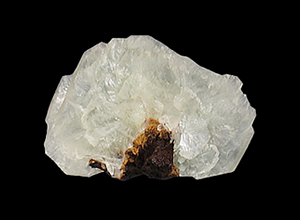 Here we present an example of the uncommon carbonate mineral, Gaylussite. Gaylussite is chemically a fairly simple carbonate mineral, but is not commonly found around the world. The crystals are typically grey, colorless or whitish in appearance, but can be quite gemmy from certain localities. 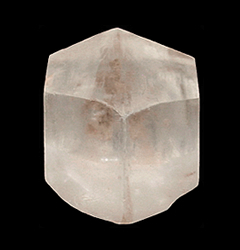 This double-terminated, translucent, colorless crystal is an excellent example of the species. This "floater" crystal is larger than average for the species. 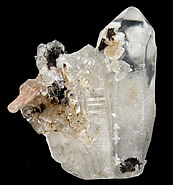 Anglesite crystals are not that uncommon, but from the Amelia Mine they are almost unheard of. When they are found they typically measured in millimeters. This example, at 2.7 cm, is huge by Boleo District standards. And if that isn't enough for you, this double-terminated crystal also has inclusions of Boleite as well as clusters of Paratacamite on its surface, some of which are are either covering Boleite crystals or are pseudomorphs after Boleite. Hydroxylapatite pseudomorphs after tabular hemimorphite blades are rare from this very obscure Mapimí area mine, near the famed Ojuela Mine. A sculptural dense cluster of bladed brown and tan-colored pseudomorphs is accented with a tan botryoid of Apatite. The large pseudomorph blade is 1.7 cm and the Apatite botryoid is 4 mm. A fascinating and rare pseudomorph combination. This material was mined in the 1960s. 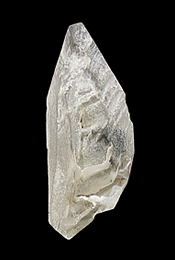 This aesthetic specimen of Barite consists of very thin group of pointed tabular blades to 3.3 centimeters perched on gossan matrix. There is also a secondary growth of smaller Barite crystals on one side of the specimen. These specimens were collected by benny Fenn around 1971. 3.5 x 2 x 1.5 cm. 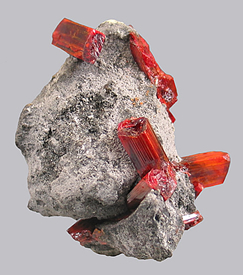 This vividly colored specimen of dark red crystals of the Mimetite varietal, Campyllite is a classic. 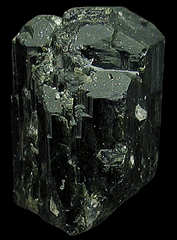 This specimen features many lustrous, curved crystals set on a background of black, Manganese mineral. Most Campyllite specimens found at this location are a burnt-orange to brick-red color; these darker red examples are very uncommon. Difficult to photograph, this specimen looks better in person. 4.5 x 1.3 x 1 cm. A neat and unusual little specimen from the famous Brushy Creek Mine in Missouri. This curvy column of shiny Pyrite crystals looks even better in person. 3.6 x 2.0 x 1.2 cm. Here we have one of the harder native elements to find for your mineral collection. Native Lead is just not that common and specimens exhibiting even the crudest crystallization are even rarer. This sheet of crudely crystallized native lead on matrix is from a find made around 7-8 years ago. 4 x 2 x 2.2 cm. An extremely lustrous stack of twinned Zircon crystals is one of the better examples that I have seen from this famous location. Many examples of Zircon from this location are water-worn or aesthetically challenged. This specimen has sharp, well-defined crystallization. In addition to its attractive appearance under natural light, this mineral specimen fluoresces an intensely bright yellow when illuminated by SWUV light. 4.5 x 3.9 x 2.9 cm. Here we have a large, for its species, twinned crystal of Chalcopyrite perched on a matrix of Sphalerite. As an accent to this specimen there are several Quartz crystals. Not your usual Peruvian sulphide specimen. 5.1 x 4.5 x 4 cm. These dramatic pseudomorphs were originally formed as Marcasite crystals on the ocean bottom. These unusual specimens were later pseudomorphed to Hematite making for a very three-dimensional and attractive mineral specimen. These radial bursts of crystals were found in the remote western desert of southwest Egypt and dug up by French dealer Alain Carion. This find was made a number of years ago and I have not heard of any new material being found. 2.4 x 2.4 x 1.5 cm. The Daoping mine is China's premier locality for world-class Pyromorphite crystals. The amazing thing, though, is that amongst the multitude of Pyromorphite to be found from this all-but-defunct location there were a small number of extremely large (for the species) single crystals. These chunky single crystal specimens made their debut at Tucson in 2008 and were quickly bought by savvy collectors. A small cluster of the antimony sulfide mineral, Stibnite. This specimen has tiny crystals of Quartz on one side. The Murray Mine is noted for its Stibnite crystals. 3.5 x 3 x 2 cm. The outstanding feature of this aesthetic mineral specimen is the rare Silicate mineral Hubeite. 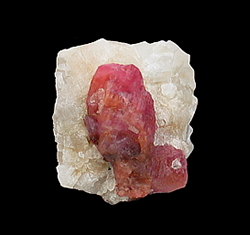 Hubeite is only found at one location in the world, the Fengjiashan Mine in western China. This specimen is comprised of many fan-like clusters of Hubeite measuring up to 7 millimeters in size. Also present on this spectacular specimen are dozens of water clear crystals of Apophyllite and a 1 cm. crystal of the mineral Inesite. Most Inesite crystals found at this mine are only a few millimeters long, making the one present on this specimen quite large. The largest Inesite crystals found at this location only measured 1.5 cm. This outstanding specimen is a good example of the diversity and quality of minerals that can be found in China. 4.9 x 3.2 x 2.8 cm. This outstanding specimen of Realgar is from the find made in late 2005. 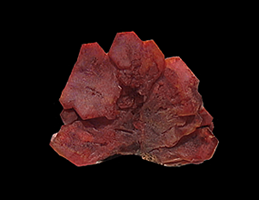 This stunning find produced a limited amount of specimens and are considered to be among the best ever found at this classic locality, which has been regarded as the premier location for Realgar specimens. This Mine is now closed and the lower levels have filled with water and the pumps have been turned off permanently. 5 x 3.4 x 2.1 cm. 5.3 x 3.6 x 2.5 cm. Here we have another one of nature's curiosities, a Calcite specimen that is heavily included by sand. Originally labeled as coming from the Sahara Desert, Saudi Arabia. The Sahara Desert does not extend into Saudi Arabia, therefore the most accurate location is North Africa. 2 x 1.7 x 1.7 cm. This specimen represents a uncommon triumvirate of minerals in an association that I had not encountered before. 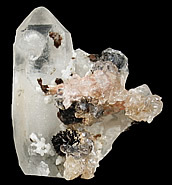 This unusual mineral specimen features many black Biotite crystals and several Galena crystals encased in a matrix of coarsely crystallized Cerussite. This specimen was collected in 1980 before the Demix Quarry was incorporated into the Poudrette Quarry. 4.2 x 4.2 x 2.4 cm. An unusual, partially hollow ball of tan Siderite with scattered, lustrous, translucent Calcite blades from the classic Nikolaevskiy Mine, Dal'negorsk, Russia. This is classic material from this mine and not often seen these days. 2.5 x 1.6 x 1.4 cm. 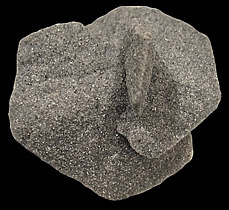 Les Farges is one of the premier localities in the world for Pyromorphite. 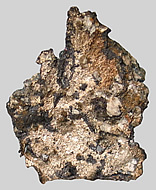 This specimen is a good example of why this location has a reputation for producing world-class Pyromorphite specimens. A highly lustrous stack of strongly hoppered, fat, prisms make for a sculptural and aesthetic specimen. You don't see many of these around these days and the mine has been closed since 1981. A small but fierce specimen of Pyromorphite from a classic French locality. 4.2 x 4.2 x 2 cm. Here is a mineral specimen that you don't see for sale every day, or at least I haven't. 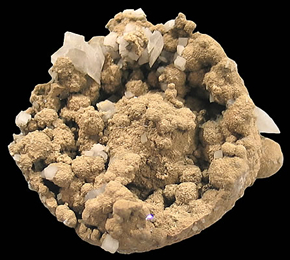 This interesting mineral specimen consists of three interpenetrating Gypsum crystals that are heavily included by sand. The label that came with this specimen says that the sand that is incorporated in the Gypsum is oil-bearing. When was the last time you saw a mineral specimen from Saudi Arabia for sale? 2 x 1.1 x 1.3 cm. This Pyromorphite is a rare locality piece from our neighbors to the north. Only a few Canadian locations have ever produced any Pyromorphite crystals of note, the Society Girl Mine being the most famous. This well formed compound crystal is an excellent example from a country not known for its Pyromorphite specimens. 3 x 2.5 x 2.5 cm. This Epidote crystal comes from a mineral location that Peter Bancroft dubbed as one of the world's most inaccessible areas and a wild and forbidding spot to collect. Fine Epidote specimens from this remote location are much prized by collectors and in my opinion they are among the finest examples of this mineral species. From a classic German locality comes this electric-blue Halite specimen. The CalTech website states that Blue Halite is the result of exposure to natural radiation. Initially, if Halite (common salt) is exposed to gamma radiation, it turns amber because of F-centers. They are mostly electrons trapped at sites of missing Cl- ions. In time the electrons migrate to Na+ ions and reduce it to Na metal. Atoms of Na metal, in turn, migrate to form colloidal sized aggregates of sodium metal. They are the cause of the blue color. 3 x 2.3 x 1.6 cm. 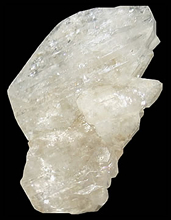 A crystal of one of the rarer varieties of Feldspar, Hyalophane, from the classic locality of Zagradski Potok Mine which in my opinion is the only one for good specimens of this species. Hyalophane is the Barium analog of Orthoclase. 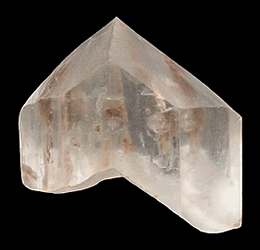 This clear-to-opaque crystal exhibits parallel growth and has a good luster. This mineral location was lost for years, until in 1978, a group of collectors rediscovered it. Very few specimens of this species make it to the United States as they are highly prized by European collectors. 15 x 7 x 3 mm. This cool thumbnail specimen represents one of the rarest gem minerals known. 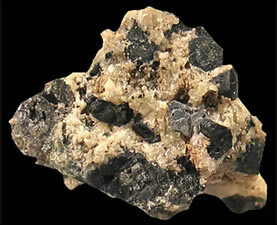 Until about a year ago only several examples of this mineral were known to exist. While more have been found recently, the quantity has not been that significant. Examples of this mineral are selling for insane prices (often in the four-figure range) with cut stones going for thousands of dollars per carat. Since this crystal is not gemmy I can afford to sell it for a very reasonable price. Another neat fact is that this crystal was one of the 6 mineral specimens that were featured in mindat.org's 2006 Tucson Inn Suites show report. 3.6 x 3.9 x 4.5 cm. When one thinks of Selenite from Australia, on thinks of the needle-like sprays that are quite abundant. What we have here is a much more uncommon crystal from Australia. 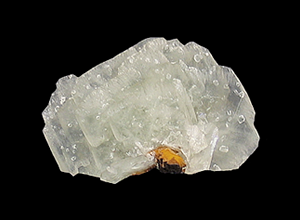 This Selenite is complete all around and has a textbook-like form with a fishtail termination on its bottom. This Selenite is much clearer than it appears in the photo. 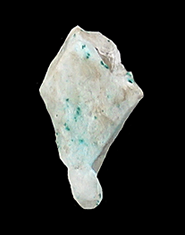 A specimen of transparent Halite with color varying from intense blue to nearly colorless. the specimen is crowned by crystals measuring up to 3.5 mm in size. The color is due to atomic lattice defects, not due to inclusions or impurities. 4 x 3 x 2 cm. 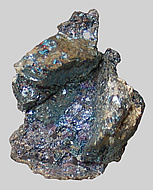 A sheet of Silver flanked by two chunky Silver crystals with a coating of iridescent Bornite. A good example of this classic mineral association from a long defunct locality. A specimen that would make an excellent addition to anyone's mineral collection.